I have lots and lots of finished projects to show you (some from quite a while ago), but let’s talk first about the latest knitting pattern I published last week : Cookie Surprise. I barely got home that I already had an idea : triangular shawl, garter stitch, lace arrows… I swatched and did all the math, but I had to put aside for awhile to finish other things. Summer, August and family vacation arrived. Expecting our 3rd baby, I knew I needed a small and easy project. This shawl idea was perfect : maths were done, explanations already scribbled on paper… I worked on it for 2 weeks, between 2 sleep in and 3 naps, between my bed and the deckchair. 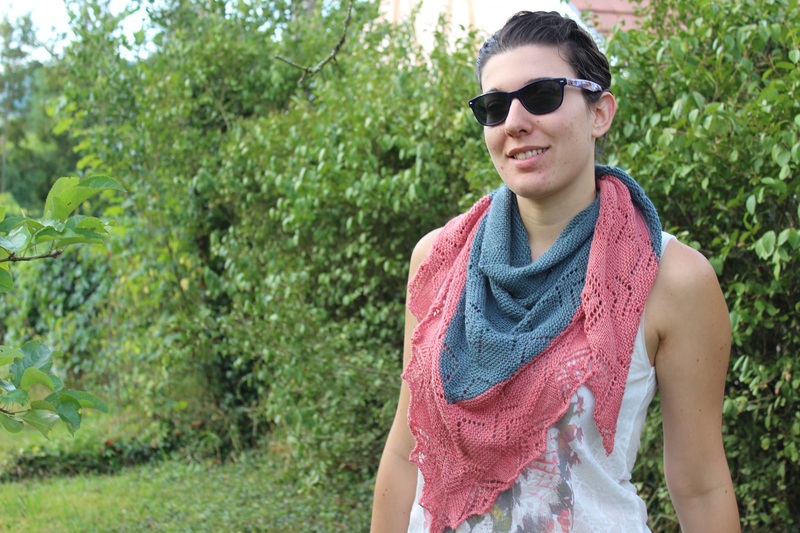 When our vacation was over, so was the shawl and I was really happy with it ! Mine is gone to Paris and L’oisiveThé, so I need to knit another one (after some baby knitting)… Anyone fancying a little KAL ? To be informed of the latest news from Instants de Louise, suscribe to the newsletter.